Racing is a model alloy wheels are much favored especially by young people, of course, that the appearance of the motor becomes more attractive and sporty impressed. In addition to the physical form of interest, this alloy also has other advantages compared with the wheel radius as easy in perwatannya. However, because the wheels racingterbuat of a mixture of aluminum alloy and steel, so if you have speleng, the stability of this alloy can not be 100% back to normal, despite being in the press again. Therefore careful in choosing is mandatory when you want to buy this wheel. 1. Before buying check the wheels first density, can be done by knocking cross section wheels with metal objects. 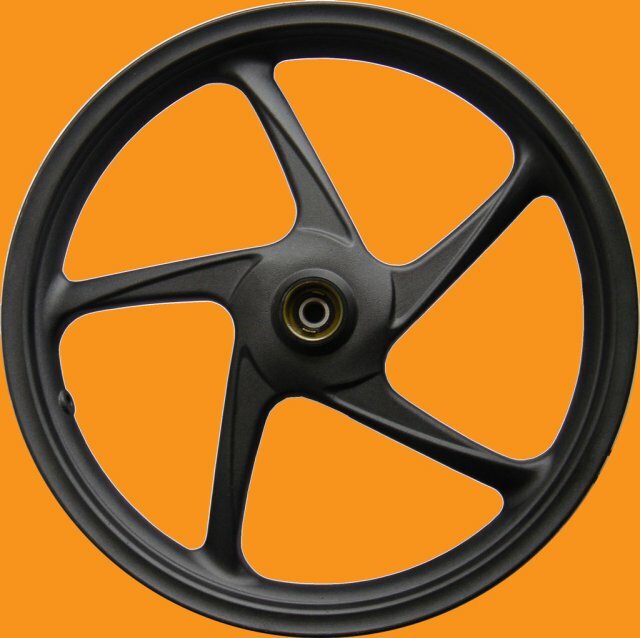 When a loud sound produced by the wheels can be made from materials that are less solid or hollow. 2. Ask the seller to check the wheels using a special tool that is used to menyetelvelg, pointless for us to know whether the wheels round stable or speleng. 3. The price for a good quality racing wheels around 800 thousand except the second, do not forget to ask for a warranty replacement if it turns out that you bought wheels unstable or speleng. 4. Select the ORI quality (original). Although more expensive essential durable, racing wheels with quality instead of more risky ORI pengalami broken crossbar when you break through a hole in the road. 5. Use tubless tires, because the weight is heavier than the racing wheel to wheel radius and is actually intended for a tire wheel racing tubless only.